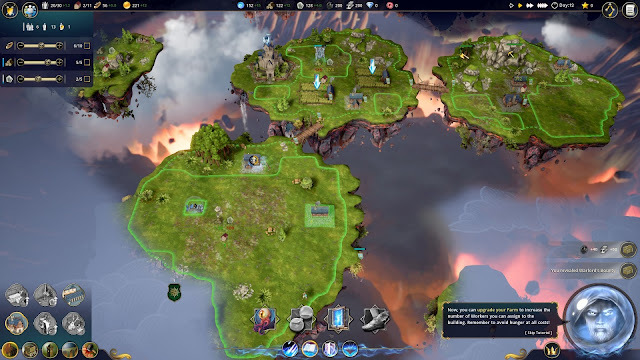 Early access preview by Ginny W.
4X games like Civilization and Europa Universalis are known for being meaty affairs, not least of all because they’re usually a tactical experience on two fronts – building up your own empire and contending with the omnipresent threat of foreign invasion. There are countless iterations on the genre but the common thread between many is the fact that that building your own empire is the activity that lays the foundation for the rest of the gameplay, and unsurprisingly, they’re fans of the adage “Rome wasn’t built in a day”. Related reading: Another decent 4X game with a fantasy theme is Worlds of Magic. Matt's review of the game here. Growing a fledgling nation is often precarious, slow, and daunting. Not everyone has the patience to watch a scout meander across the length of their chosen screen to find a resource node, only to have to also wait for a builder to make that same journey and to put a resource-farming building of some kind in its place before any kind of tangible reward comes from your exploration. Driftland: The Magic Revival is still in its early days, but it’s already shaping up to be a take on a popular genre that does away with all the downtime of empire creation without diluting the very essence of what these games are meant to be about: exploring, expanding, exploiting and exterminating. The title opens with a rather lengthy visual explanation of how its setting has come to be in its current state – a mass of fractured, barely habitable islands just ripe for the taking as long as you’re a powerful enough sorcerer. The long and short of it is that there was a catastrophic magical event that devastated the world, but if we’ve learned one thing from fantasy tropes, it’s that magic can be used for good despite its incredibly destructive power. That’s where you come in; you play as a magician who has the power to bring the world together (quite literally) and with a bit of cosmic guidance in the form of a rather fatherly tutorial mode and some elbow grease, you’re well on your way to a prosperous existence. 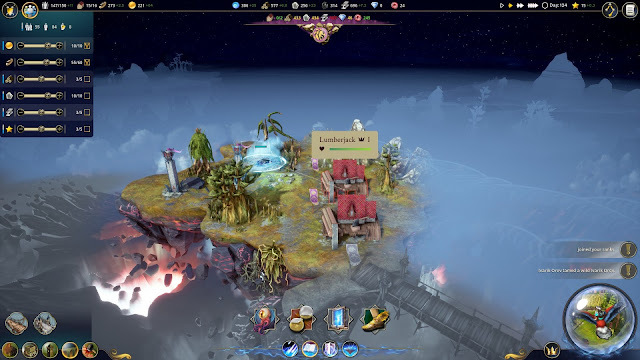 Driftland: The Magic Revival being the name of the game feels a little too on the nose in hindsight; your modus operandi is connecting drifting islands in the world using magic for the purposes of, well, reviving it. It looks like there will be four races to choose from once the game is released, but you can only play as humans or dark elves for now. Races will have their preferred environments, but from the selection currently, it’s not worth sweating the fine print too much when the game mode available is a sandbox singleplayer one. You kick things off by being introduced to your home island i.e. the one that’s got your ever important basic stronghold, before you’re given an entire arsenal of magical spells to use at your leisure. There are multiple schools of magic that you can turn to your advantage, but perhaps the most crucial throughout my playthrough were the spells that enabled me to scout out islands that had the resources I needed before dragging them close enough to me to exploit like some needy magical void. You’re afforded a variety of different POVs and ways to view your growing landmass of an empire – my personal favourite for tracking was the view that looked like an old fashioned explorer’s map – and there’s just something very satisfying about the immediacy with which you can explore and expand in this game. As evidenced by the speed of which you can acquire new territories in Driftland compared to some more old-fashioned titles like Civilization, expanding and exploring feel less like two separate, linear sequences than one streamlined action. This is probably facilitated mainly by the lack of a turn-based function in the singleplayer sandbox, but this could well change once the title has been optimised for multiplayer. Acquiring a new resource hub is only a few clicks and a single worker away – the fact that you can move islands around mostly at your will and get what you need from them in a matter of minutes means that you don’t have to agonise too much over decision-making. Once you’ve got a new island, there’s not much else left to do but the classics: strip-mining its resources for your empire, setting up a cottage for your labourers, and making sure that you’ve got a burly knight or two to chase off others who want your crops and rocks for themselves. All the staples of the 4X genre are there when it comes to Driftland: you’ve got to balance competing resources with your population, you need to maintain exploration and combat units to defend your empire, and you’ve got to make sure that none of it crumbles when enemies come knocking. There are some pretty cool combat units to pick from when it comes to defending your far-reaching empires – my personal favourites were the flying knights which made quick work of magical enemies who’d seem to materialise whenever I sent a poor explorer out alone to quickly fetch some lumber on an otherwise abandoned island. Your magical god powers also get upgraded as you go, which means that anything the light touches in this game is really all yours for the keeping if you’re smart about resource and mana management. 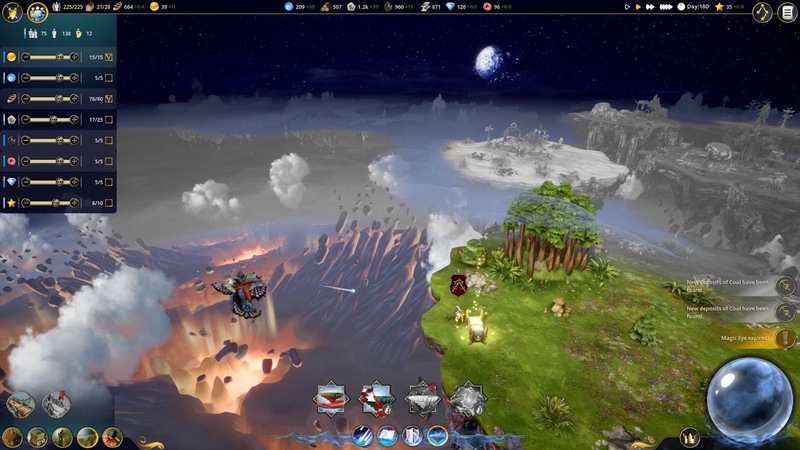 It’s easy to see how Driftland could make for an incredibly fast-paced multiplayer game; your ability to be spans away on a map thanks to the power of magic, combined with the speed with which you can pump out units, resources, and buildings to power all of the above up makes older titles look simply glacial in comparison. However, something being too streamlined may be possible – Driftland is missing a lot of the mouse-over displays and information blocks that often accompany yours and enemy actions in games like Civilisation and Endless Legend. It’s all very well to get a small text alert when you’re having a fortress totally decimated but when you’re in the thick of things and expanding at a pace that makes Western colonialism seem trivial, sometimes you need a little bit more of a heads up when important events are occurring. Related reading: Europa Universalis IV is our vote for the greatest 4X game out there. Matt's review. There’s no doubt that Driftland has the bones of a successful strategy game which draws heavily on the 4X genre. However, as it’s still in its relative infancy, it suffers from a couple of expected balance issues. 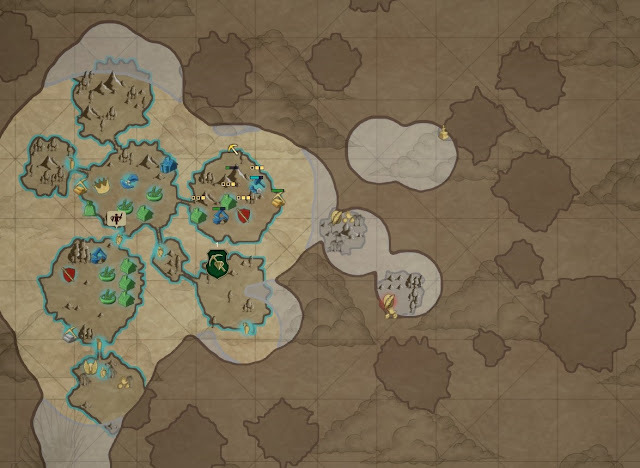 Resource management can get a bit tight, but any difficulty that causes is offset by the incredibly low penalties that come with exploring absolutely every inch of the map. While 4X titles are usually predicated on the idea that you’re building your empire so as to not fall prey to bigger fish in the sea, the lack of that sense of danger in Driftland’s current playable content dampens the experience a little. However, that having been said, it’s a neat title which has done a great job of making traditional concepts accessible and fun – after all, who can really say no to god mode when it’s been packaged as delightfully as it has been here?